Grant Wood, American Gothic, 1930, oil on composition board, 30 3/4 x 25 3/4 in. 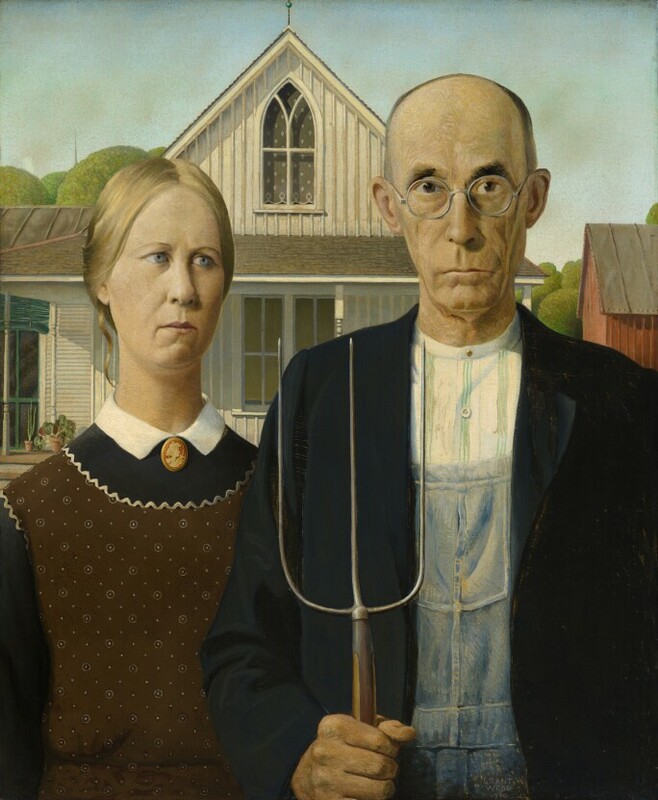 New York - There’s something eerily familiar about the mood in Grant Wood’s 1930 masterpiece American Gothic. The weathered farm couple looking skeptically outward from their rural home, the man’s pitchfork dug protectively in the ground. It is similar to the wary, conservative, even judgmental way that rural America is often portrayed in today’s political climate. The show will go well beyond American Gothic, however, which is just one work that appears alongside some 120 others by Wood. In addition to well-known paintings like The Midnight Ride of Paul Revere, 1931, and Daughters of Revolution, 1932, there will be one room devoted to Wood’s arts and crafts work; another gallery that considers his connections to literature, including his book illustrations and covers; and displays of his decorative art objects, such as a Steuben glass vase, a corncob chandelier, and a chair and ottoman. The curators want to challenge the popular notion that Wood is merely a Regionalist painter – a reputation the Whitney itself helped establish with its 1983 show Grant Wood: The Regionalist Vision. Back then, there was an idea that Wood’s paintings paid tribute to a Midwest in need of an uplift, providing “images of prosperity and abundance that steadied the nation at a time of crisis, and that suggested he had served the nation well, but once the decade was over he’d lost his relevance”, Haskell said. Although Wood was raised in Iowa at the turn of the 20th century, he studied art in Chicago and Europe and so wasn’t exactly the farmer-painter he let some people believe him to be. More than paintings of Midwestern prosperity, Wood’s finely detailed work is rich with timeless theatrical elements that makes him more comparable to an artist like Edward Hopper than the Missouri muralist Thomas Hart Benton, Haskell said.